Teddy Bear Tosses continue across the OHL! Get the scoop on that and more in the latest edition of the OHL This Week. Kingston Frontenacs sophomore forward Paul Larabie and Soo Greyhounds defenceman Jacob LeGuerrier scored their first career OHL goals this past week. His is the latest instalment to a season full of OHL Milestone Moments that can be seen here. Ten Ontario Minor Hockey Association teams from the South Central AAA Minor Midget League will battle head-to-head in a series of games in front of hundreds of pro, junior and university scouts at the Sixteen Mile Sports Complex. This is one of the few times a year that all the league teams will be under one roof competing at the same time. This will be an action-packed weekend with high quality Minor Midget hockey. These players are some of the best that the OMHA has to offer. For full details visit omha.net. Ticket Packages for the 2019 Memorial Cup Presented by Kia are now on sale. These packages include all eight games for the event as well as an additional game if a tiebreaker game is necessary. Packages are available for $450 and $350, before taxes and service charge, for red section and grey section seating. The 101st Memorial Cup Presented by Kia will take place in Halifax from May 16-26, 2019. For more information visit chlmemorialcup.ca. 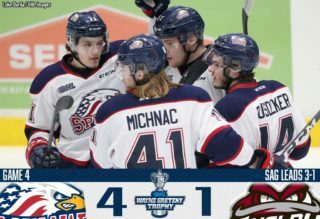 Spits celebrate 10 years at WFCU Centre on Thursday: Memorial Cup Champions Michael DiPietro and Harry Young will be at the WFCU Centre on Thursday as the Spitfires celebrate 10 years in the building when they play host to the Sarnia Sting. The Spits celebrate a decades worth of memories including three different Memorial Cup titles. For more information visit windsorspitfires.com. Petes hold Teddy Bear Toss on Thursday: The Peterborough Petes hold their annual Teddy Bear Toss on Thursday when the Hamilton Bulldogs visit the PMC. Volunteers from local minor hockey teams will collect new stuffed toys, mittens or toques from the ice and those items will be donated to the Energy 99.7/Country 105 Miracle Toy Drive. Full details on Thursday’s events can be found at gopetesgo.com. Sting host 21st annual Teddy Bear Toss on Saturday: The Sarnia Sting will be providing the Salvation Army with Teddy Bears this year when the club host its 21st annual Teddy Bear Toss on Saturday afternoon against the Kingston Frontenacs. For more information visit sarniasting.com. IceDogs host Teddy Bear Toss on Saturday: The Niagara IceDogs host their annual Teddy Bear Toss on Saturday at home to the North Bay Battalion. The teddies will be donated to the Niagara Regional Police Association and Victim Services. Teddy Bear Toss in Mississauga on Sunday: The Mississauga Steelheads host their 7th annual Teddy Bear Toss on Sunday afternoon when the Trout take on the Saginaw Spirit. The Steelheads have teamed up with Canadian Tire and the Boys and Girls Club of Peel to distribute the new stuffed toys to children in need this holiday season. For full details visit mississaugasteelheads.com. Battalion players serve up lunch at The Gathering Place: North Bay Battalion players Daniel Walker, Brad Chenier, Rhys Forhan and Luke Moncada helped The Gathering Place serve lunch this past Wednesday between their morning workout and afternoon practice. The Gathering Place serves the North Bay community, providing a hot meal in a warm environment to those in need. Watch CTV Northern Ontario’s coverage of the special visit. Spitfires name Dennis Gignac Alumni Association Coordinator: The Windsor Spitfires have named longtime teacher and Spitfires academic advisor Dennis Gignac as the club’s new Alumni Association Coordinator. Gignac taught at St. Anne Catholic High School over a span of 35 years (1979-2013). From 2006-13, he served as academic advisor of the Spits’ high school aged players. Throughout his career, he coached at the minor, high school and junior hockey levels for more than 25 years. For more information visit windsorspitfires.com. Chris Neil recognized in North Bay: The Ottawa Senators sent a crew to North Bay this past month to document Chris Neil Night at the Memorial Gardens on November 16th. Hear from Neil as he connected with familiar faces in the city he played his OHL hockey in from 1996-99. The 39-year-old recently announced his retirement following a 15-year career with the Senators from 2001-17. Watch at battalionhockey.com. Former Generals star Middleton has #16 retired by Bruins: Long-time NHL forward Rick Middleton had his #16 retired by the Boston Bruins this past week. The Toronto native spent two seasons with the Oshawa Generals from 1971-73 before being selected by the New York Rangers with the 14th overall pick of the 1973 NHL Draft. Middleton, who won the Red Tilson Trophy as the OHL’s Most Outstanding Player in ’73, went on to spent 14 seasons in the NHL while also appearing in two Canada Cups (1981, 1984). He played in 1005 career regular season games, amassing 988 career points including 448 goals and 540 assists. His banner joins fellow Generals grad Bobby Orr’s number 4 atop TD Garden. Pasquale wins in NHL debut: Saginaw Spirit graduate Eddie Pasquale made his NHL debut at the age of 28 on Tuesday, backstopping the Tampa Bay Lightning to a 6-5 shootout win over the Detroit Red Wings. The Toronto, Ont. native saw his first NHL action following seven years spent in the minors, appearing in 235 career AHL contests. Originally a fourth round pick of the Atlanta Thrashers back in 2009, Pasquale played parts of four OHL seasons between Belleville and Saginaw from 2006-10, going 75-48-6-7 with a 3.11 goals-against average and .911 save percentage over 142 regular season contests. He’s appeared in nine AHL games with the Syracuse Crunch this season. Harpur scores first NHL goal: Barrie Colts graduate Ben Harpur scored his first career NHL goal on Saturday, helping the Ottawa Senators defeat the San Jose Sharks 6-2. Harpur, who was plus-3 in the game, has suited up in nine games with the Sens this season. The 23-year-old from Niagara-on-the-Lake, Ont. played four OHL seasons between Guelph and Barrie from 2011-15, recording 66 points (12-54–66) over 225 regular season games while also winning an OHL title with the Storm in 2014. Ottawa’s fourth round pick in 2013, Harpur has appeared in 61 career NHL games over the past four seasons. Dineen scores first AHL goal: Sarnia Sting graduate Cam Dineen scored his first AHL goal on Wednesday. The 20-year-old from Toms River, NJ found the back of the net as the Tucson Roadrunners took a 5-2 road win over the San Diego Gulls. Dineen, who was Arizona’s third round pick in 2016, comes off a three-year OHL career spent between North Bay and Sarnia, recording 137 points (39-98–137) over 162 career regular season games. He was a member of the OHL’s First All-Rookie Team in 2016 and a Third Team All-Star last season. Barron scores first AHL goal: Ottawa 67’s grad Travis Barron scored his first career AHL goal on Friday. The Colorado Eagles forward scored in a 3-2 shootout win over the Iowa Wild, lighting the lamp in his 11th game of the season. The 20-year-old native of Belfountain, Ont. skated four years with the Ottawa 67’s from 2014-18, serving as the club’s captain last season. He recorded 149 points (59-90–149) over 250 regular season games after being the third overall pick of the 2014 OHL Priority Selection. Barron was a seventh round pick of the Colorado Avalanche in 2016. He won an ECHL Kelly Cup title as a member of the Eagles last season prior to their jump to the AHL. Peressini scores in U SPORTS action: Kingston Frontenacs graduate Lucas Peressini scored a goal as a member of the Western Ontario Mustangs on Saturday. The 23-year-old goaltender hit the empty net to give the Mustangs a 4-1 road win over the Windsor Lancers. Peressini played four years in Kingston, going 68-39-8-6 with a 2.73 goals-against average and .912 save percentage over 132 regular season games. The 2015 OHL Goaltender of the Year, Peressini set a Frontenacs single season franchise record with a 2.32 goals-against average. The Nobleton, Ont. native is in his third season with Western and is 8-4 with a 2.00 goals-against average and .932 save percentage over 14 games. Cescon returns to play in North America: After parts of seven seasons in Europe, OHL graduate Craig Cescon has returned to North American where he’ll spend the rest of the season with the ECHL’s Fort Wayne Komets. The 32-year-old from Mississauga, Ont. started the year with Romania’s ASC Corona Brasov and returns to Fort Wayne where he played during the 2010-11 season. Cescon was an OHL champion with the Peterborough Petes in 2006 and played a total of four OHL seasons between Plymouth, Mississauga and Peterborough. The Battle of the Ottawa River sees a pair of cross-league rivals square off in a weekend home-and-home. The Ottawa 67’s and Gatineau Olympiques hit the ice on Friday in Gatineau and Saturday in Ottawa, playing for the Alexandra Cup. 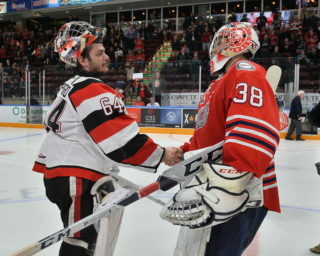 The CHL’s second-ranked 67’s have recorded at least a point in 23 straight games and feature new addition Michael DiPietro between the pipes. Despite recent injuries to young stars Marco Rossi and Graeme Clarke, the 67’s have kept right on rolling as overage winger Tye Felhaber leads the OHL with 29 goals. San Jose Sharks prospect Sasha Chmelevski has also stepped up, recording 21 points over his current eight-game point streak. Gatineau is led in scoring by big Minnesota Wild prospect Shawn Boudrias who recently represented the QMJHL in the CIBC Canada Russia Series. Defencemen Gabriel Bilodeau, Pier-Olivier Lacombe and Darien Kielb have all pitched in offensively. 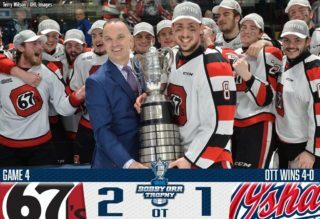 The two clubs split meetings last season, with the Olympiques prevailing outdoors at TD Place Stadium before the 67’s settled the score back in Gatineau a month later. Two talented teams meet in Sudbury on Saturday as the host Wolves take on the visiting Guelph Storm. Vaughn CHL Goaltender of the Week Ukko-Pekka Luukkonen and the Wolves have won four straight and sit tied for the Central Division lead. 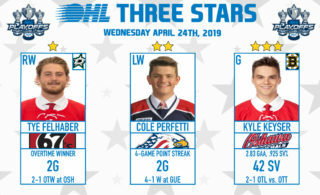 First overall OHL Priority Selection choices David Levin and Quinton Byfield lead the Wolves offensively while 2019 NHL Draft prospect Blake Murray comes off a three-point performance on Sunday. With their 17 wins, the Wolves have now equalled their total for all of last season. The Storm are .500 over their past 10 games and are looking to get over the hump as the red hot London Knights extend their lead atop the Midwest Division. San Jose Sharks prospect Ryan Merkley leads OHL defencemen with 36 points (4-32–36) while captain and Philadelphia Flyers prospect Isaac Ratcliffe leads the club with 19 goals. The Wolves defeated the Storm 4-2 back on Sept. 21st.